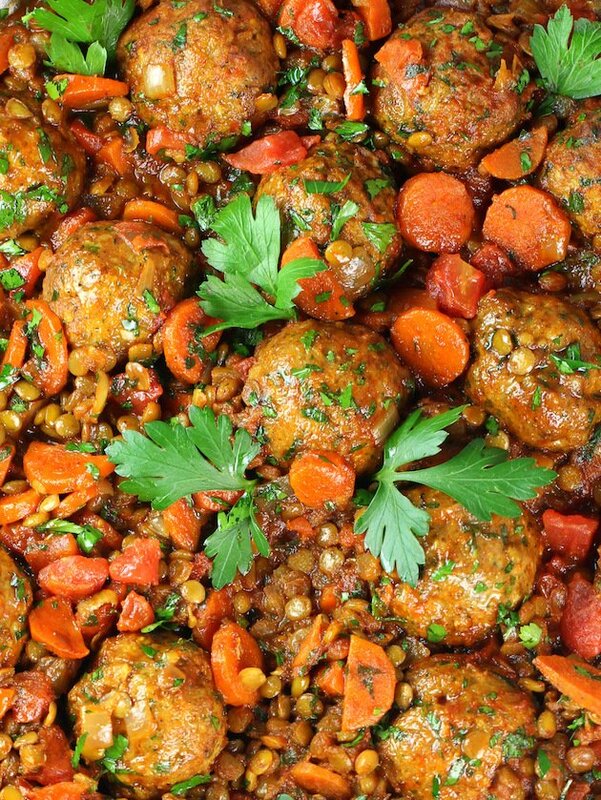 Moroccan Lentils with Turkey Meatballs – a delicious and hearty meal layered with the most delightful combination of Moroccan flavors! 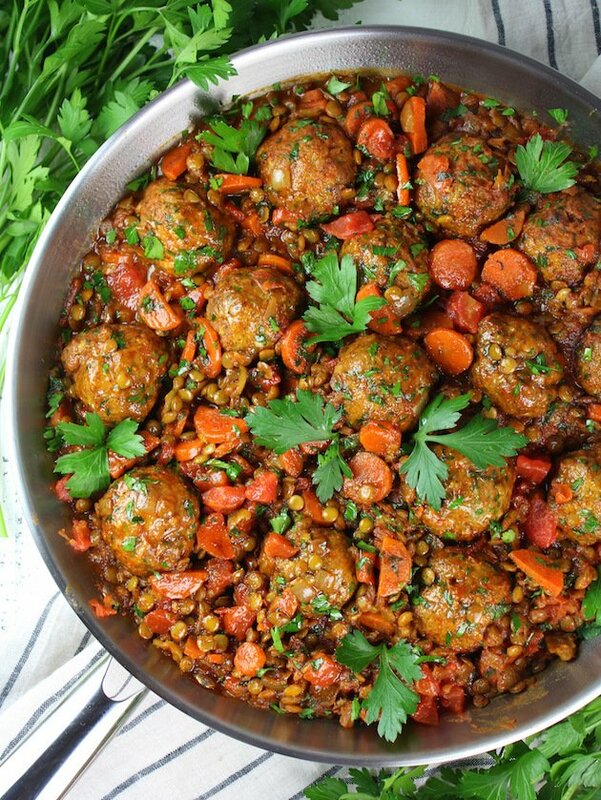 With green lentils, tomatoes, parsley, warm Moroccan spices like cumin, turmeric, paprika, cayenne, cloves, and homemade turkey meatballs. The quickest and tastiest trip to Africa ever! 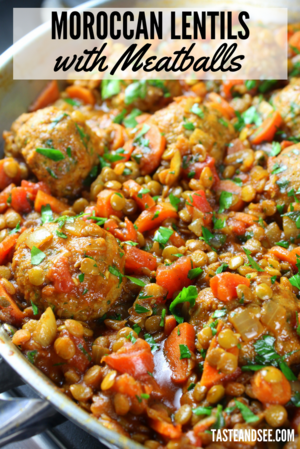 I’ve been making these warm and hearty Moroccan Lentils with Turkey Meatballs for years now. I got the recipe out of a girlfriend’s cookbook back in the day. Of course, I’ve changed it up and added my own spin on the dish – you know I can’t help myself. 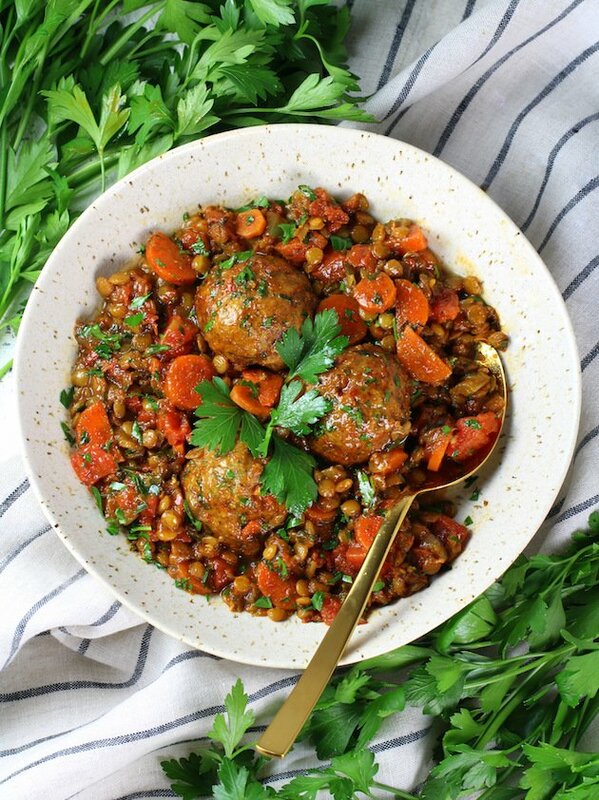 These yummy Moroccan Meatballs and Lentils are so comforting and filling, and the flavors are a unique and tasty combination of sweet and savory spices. You may have noticed Moroccan cuisine has become very popular these days. In fact, it was highlighted as one of the Top 10 Pinterest saved food predictions for 2018. Before we get into today’s recipe let’s start with a bit of a geography lesson and background on this unique and diverse country. Morocco is located at the northern tip of Africa just below Spain. Moroccan cuisine is influenced by their interactions and exchanges with other cultures and nations over the centuries. Moroccan cuisine is typically a mix of Arabic, Andalusian, Berber and Mediterranean cuisines with a slight European and African (south of the Sahara Dessert) influence. Morocco was well-situated along ancient spice routes, which is why its cuisine is so spice-centric today. “Spice routes” are also known as the Maritime Trade Routes and were some of the very first trade routes. They were a network of sea routes that linked the East with the West. They stretch from the west coast of Japan, through the islands of Indonesia, around India to the lands of the Middle East – and from there, across the Mediterranean to Europe. The principal and most profitable goods they transported were spices – giving the routes their name. Isn’t that interesting!?? But wait there’s more… Now here’s some insight into their cooking! There are so many go-to spices for Moroccan cuisine: cinnamon, cumin, coriander, saffron, turmeric, ground ginger, black and white pepper, cayenne or hot paprika, sweet paprika, aniseed, and bay leaves – but there are still more spices that come into play. Moroccans love to use lamb, poultry or beef mixed with ingredients like apricots, raisins, olives, prunes, apples, dates, nuts, and honey. All served alongside some preserved lemon and olives, couscous with vegetables, steamed greens and vibrant salads. 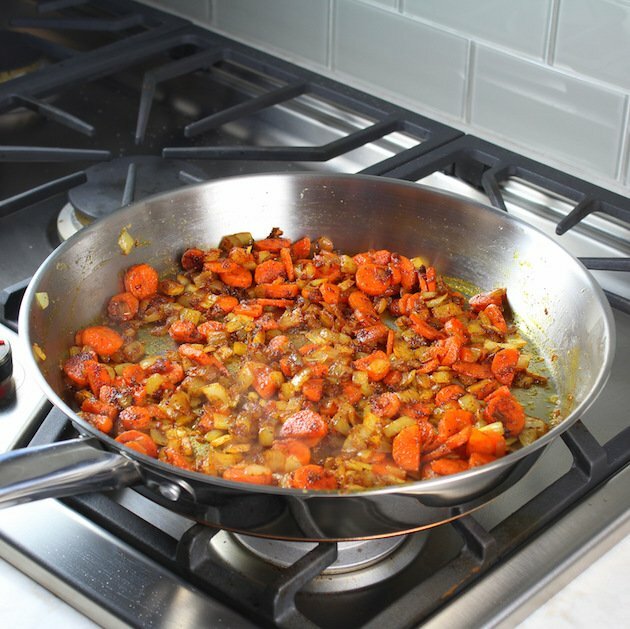 Today, our recipe stays true to the Moroccan style of cooking… combining ingredients together and layering flavors and spices to achieve the most delicious and tasty all-in-one meal. 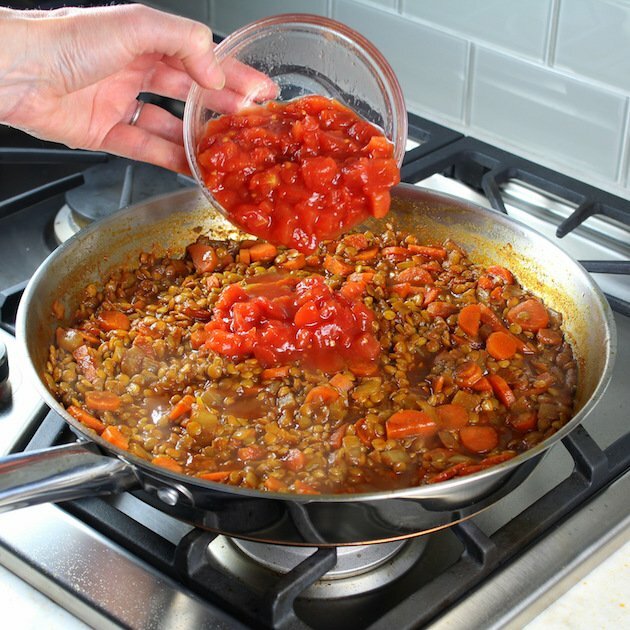 I think you’re really going to love this yummy lentil stew my friend. We start with the baked turkey meatball recipe. Annnd of course, they are infused with plenty of warm Moroccan spices. You can also use ground lamb, or chicken for but my choice for this recipe is ground turkey meatballs. 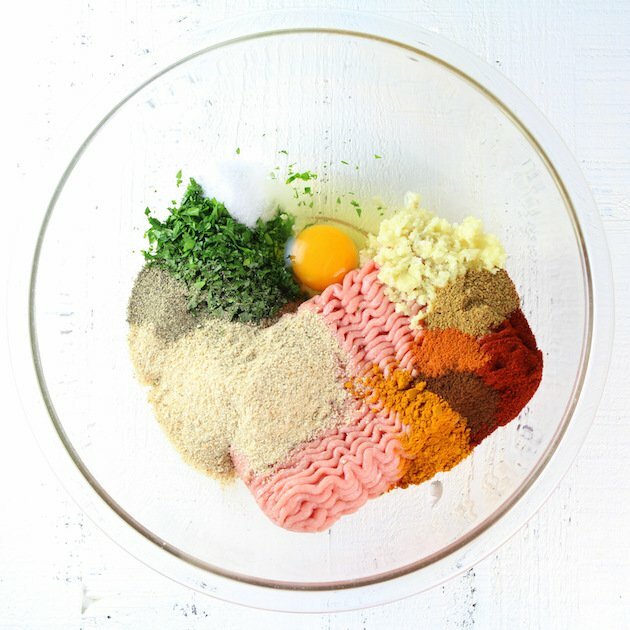 Ready for some healthy turkey meatballs? To start, combine the turkey, egg, bread crumbs, fresh parsley, minced garlic, spices and mix it together without overworking it. 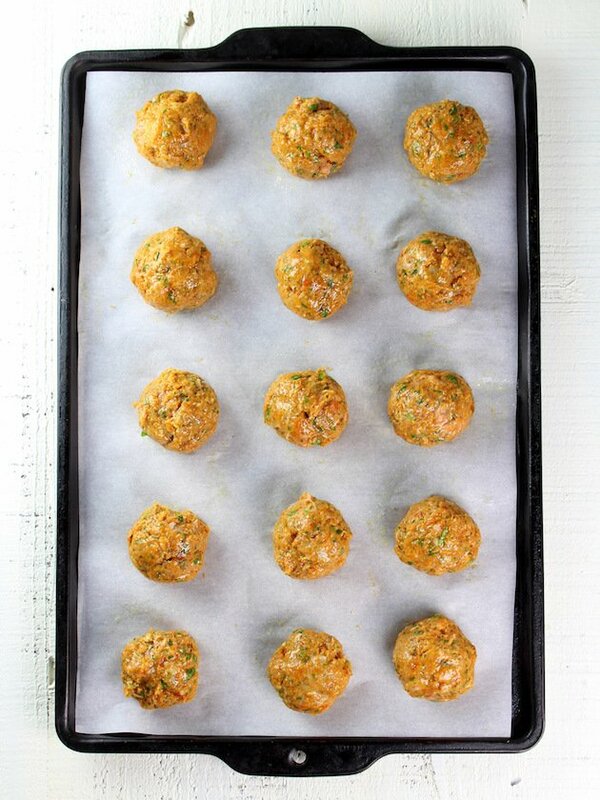 Place them on a baking sheet lined with parchment paper, spray each meatball with a spritz of cooking spray and bake in a preheated 350 degree oven for 10 minutes. 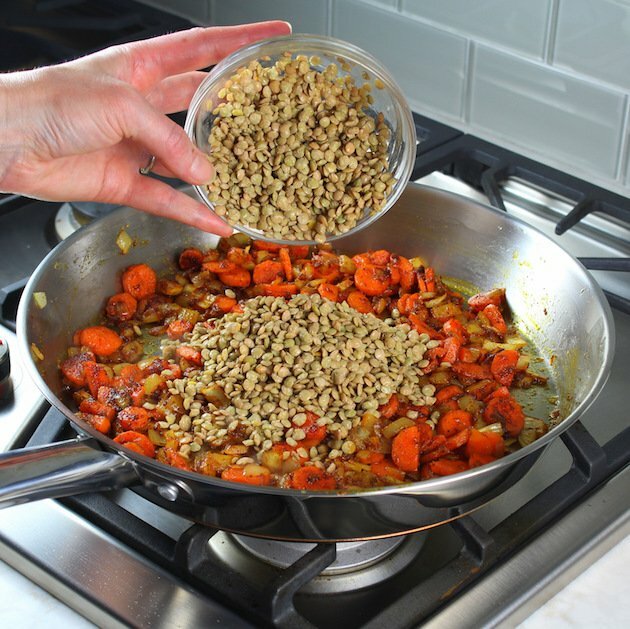 While the turkey meatballs are baking, start the green lentil recipe. 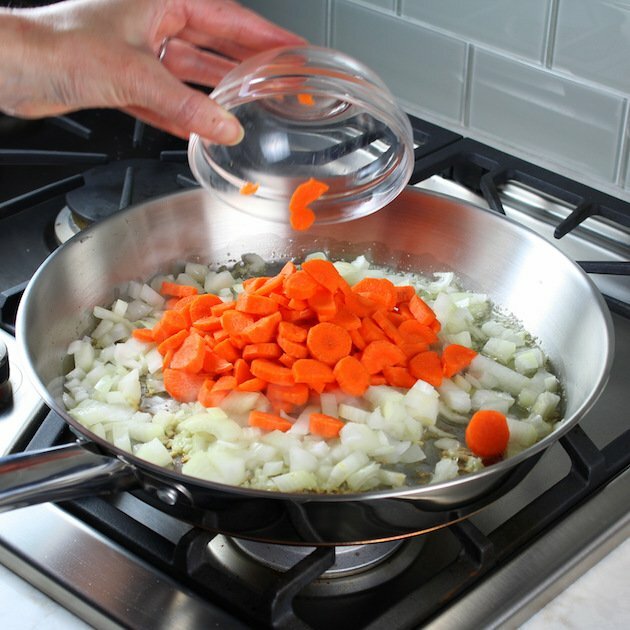 First, saute the garlic, onion and carrots in a little olive oil for 8-10 minutes over medium heat. Then stir in the spices. Now add your lentils and the chicken stock, bring it to a simmer, and cook for 18-20 minutes uncovered. Finally, add in your tomatoes, meatballs, and parsley and continue to simmer for 10 more minutes. Top it all off with more fresh parsley, and serve. 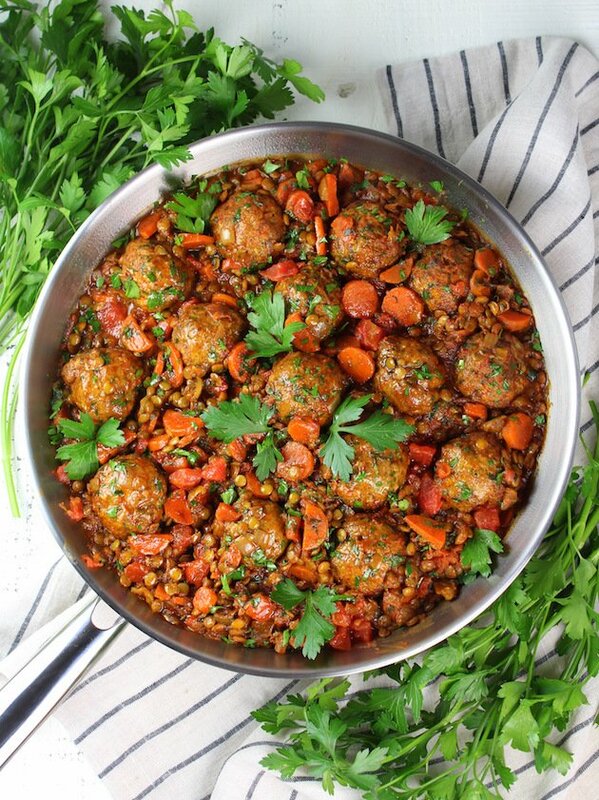 The vibrant flavorful spices, the hearty filling lentils and the tender zesty meatballs all come together to make this one scrumptious dish. 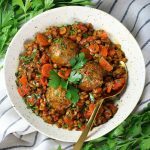 I’m excited for you to try these Moroccan Lentils with Turkey Meatballs – a delicious and hearty meal layered with the most delightful combination of Moroccan flavors! And if you’re looking for more flavorful Moroccan recipes check out this Cedar Plank Harissa Smoked Salmon or this Lemon Harissa Chicken! 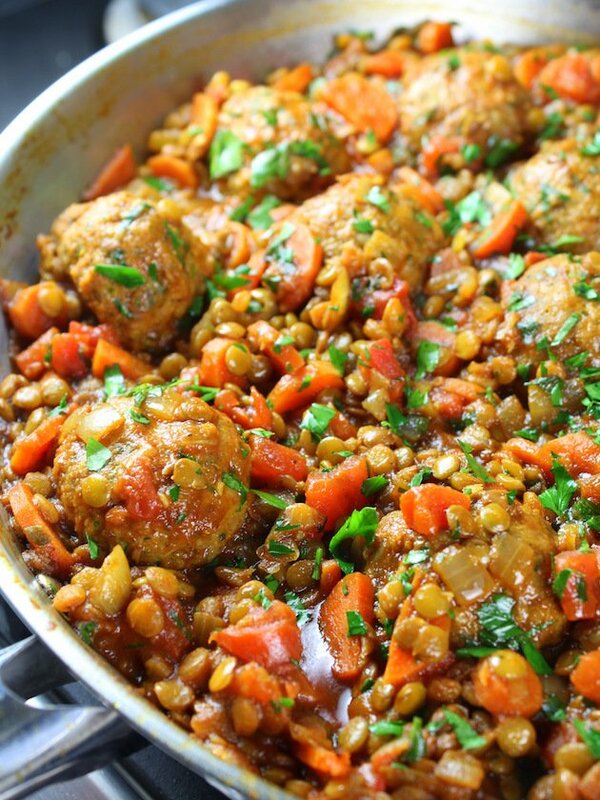 These yummy turkey meatballs with lentils are so comforting and filling, and the flavors are a unique and tasty combination of sweet and savory spices! 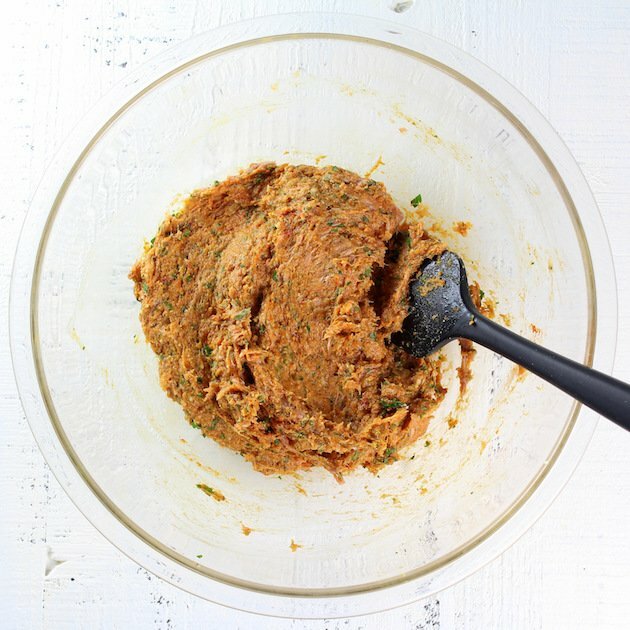 Combine the turkey, egg, bread crumbs, fresh parsley, minced garlic, and meatball spices in a large bowl. Mix together without overworking. 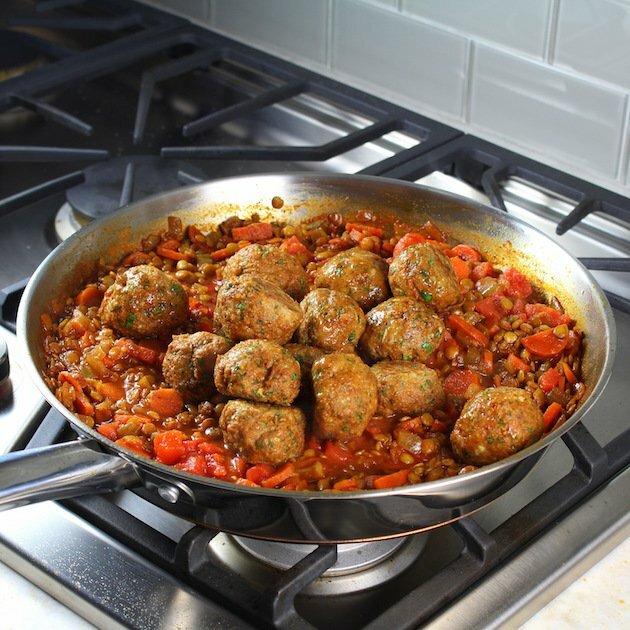 Form fifteen 2-inch meatballs and place them on a parchment-lined baking sheet. Bake in a preheated 350 degree oven for 10 minutes. 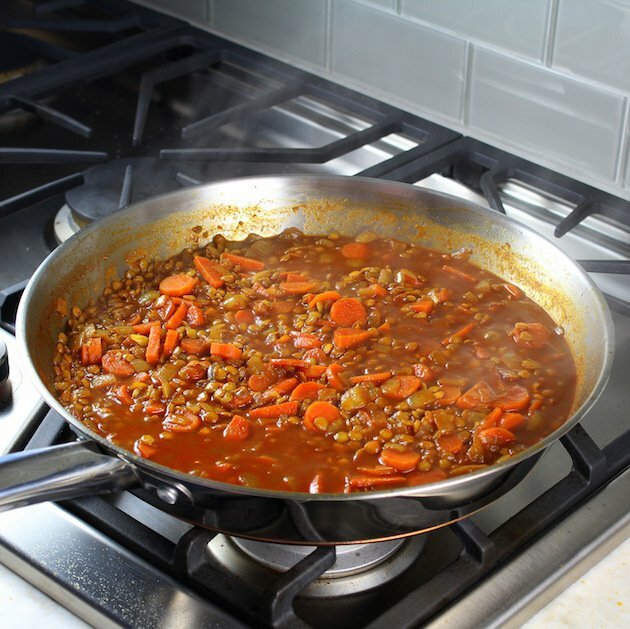 Meanwhile, start the lentils: in a large pan saute the garlic, onion and carrots in olive oil for 8-10 minutes over medium heat. 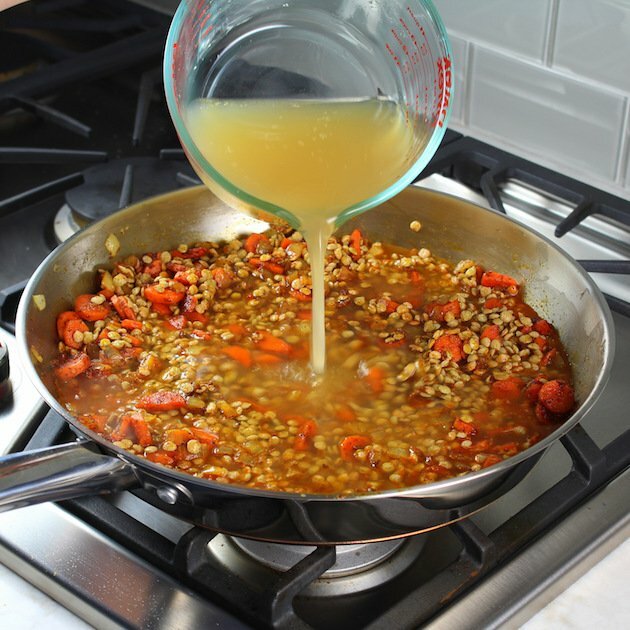 Stir in the lentil spices, then add lentils and chicken stock. 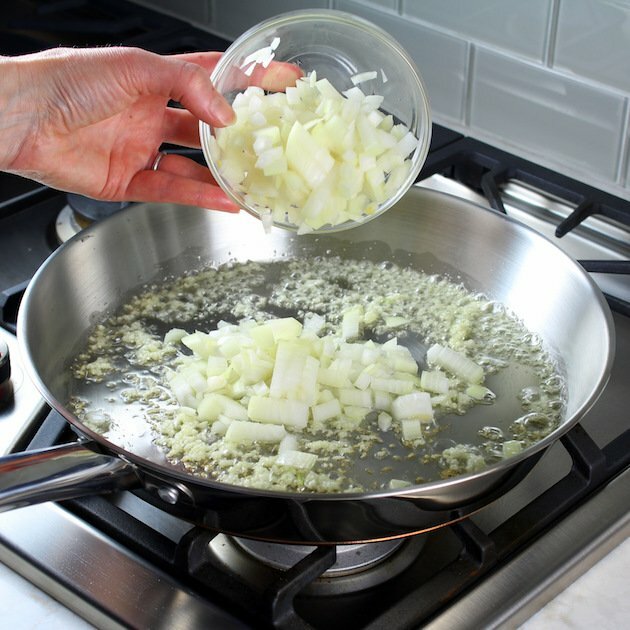 Bring to a simmer and cook for 18-20 minutes uncovered. 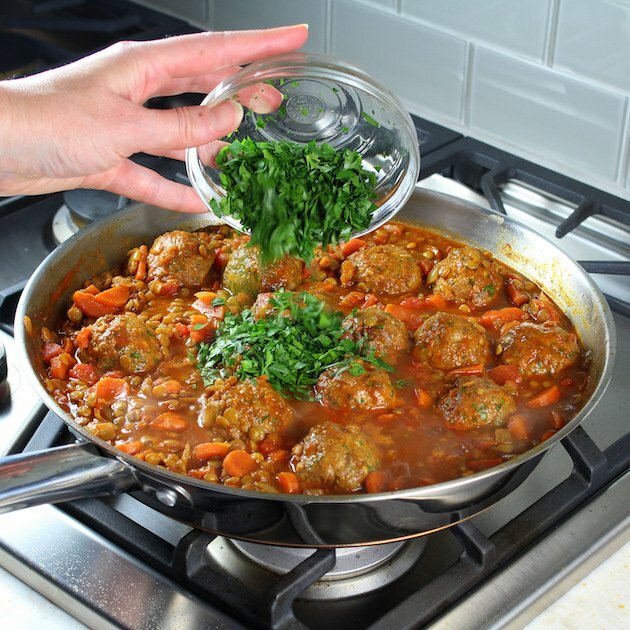 Add in diced tomatoes, parsley, and baked meatballs, and continue to simmer for 10 more minutes. An ice cream scoop sprayed with a little cooking spray works well to help form the meatballs. Clove can be a very strong spice... it can be replaced by cinnamon if preferred. Wow! Just made this and it is seriously flavored well! I will book mark this and make more items from your site. 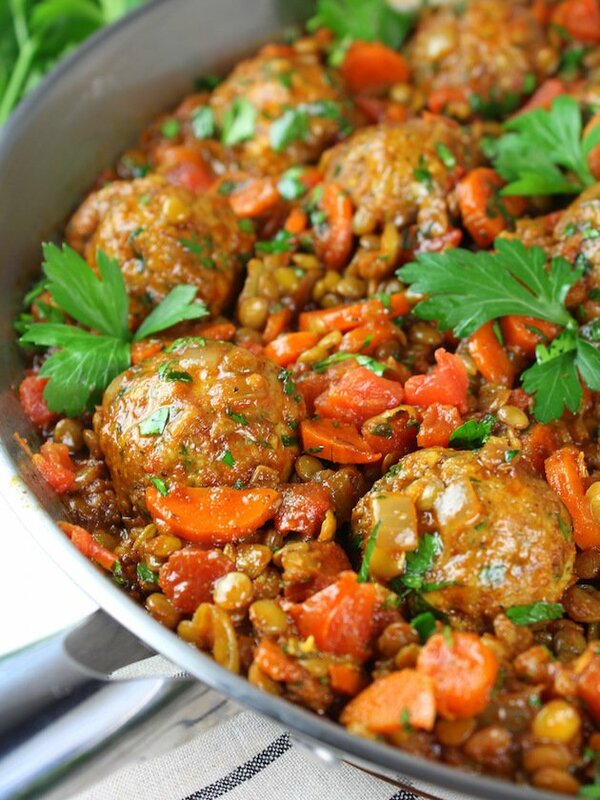 I too never thought of turkey meatballs and lentils and I am always looking for a low calorie way to make dinner. Thank you so much! Yayyy! I love hearing that, Helen! I agree this dish is like a big warm hug!😄 I’m so glad you found the dish flavorful but not too spicy! Thanks so much for taking the time to share your feedback! Hi Helen! I love that you used lamb and lamb stock! We are huge fans of lamb so I can’t wait to try that version! I completely understand your sensitivity to strong flavors. I try to keep a balance in my recipes so the spices don’t overpower the flavor of the other ingredients. I’m so glad you enjoyed the recipe and I especially like that this recipe gave your taste buds a big warm hug! Love that!!! Thank you so much. Oh boy ! These look good ! Perfect for summer ! Thank you so much ! I’m so glad to hear that! Thank you – it’s all my pleasure! Oh yum! I would have never thought to combine meatballs and lentils! Thanks my friend! 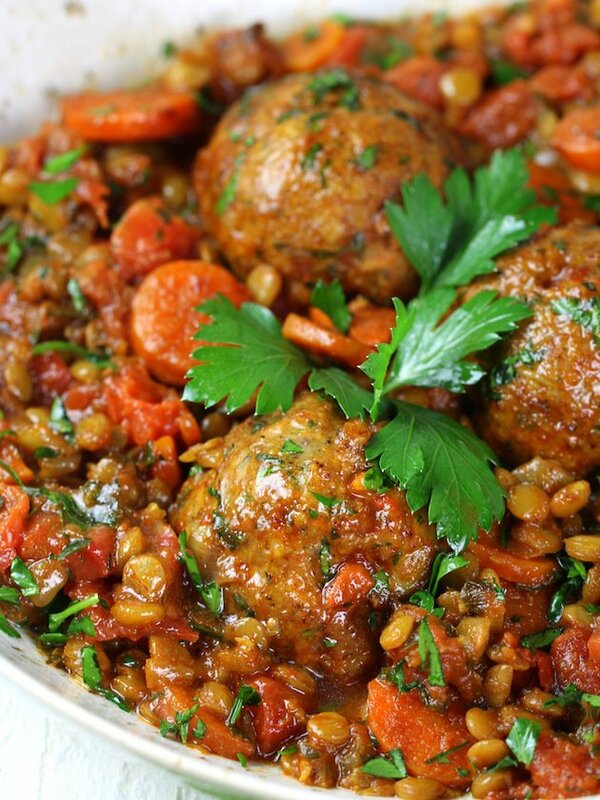 I love that I can infuse that moroccan flavor in the meatballs and lentils. I would love to hear what you think of it.